It is not unusual in the course of our day for my wife and I to talk with post abortive men and women. Men, struggling to find peace and healing, tend to talk about how the abortion of their children caused them to feel pain, guilt, anger and a “loss of manhood.” Women, many of whom are struggling with suicidal thoughts, drug and/or alcohol addiction to dull the pain and eating disorders or depression, tend to talk about feelings of guilt, anger, shame, worthlessness and “the unforgivable sin.” Post-Abortion Syndrome, a form of Post-Traumatic Stress Disorder (PTSD) is real. Many have asked us to help them share their stories in hope that readers would be spared the pain they live with from day to day. This week’s column is dedicated to one such story. Natasha here is your story and you have all of our love. My name is Natasha and I am a forty (40) year old single post-abortive mother of six (6) children. I have four (4) children alive on earth, and two (2) little girls alive in heaven, which I lost by way of abortion. I named my beautiful angels Alyssa & Melissa about three (3) to four (4) years ago by way of a revelation through the Holy Spirit. Approximately two (2) years later, I became pregnant by my former lover a second time and I shared that information with maybe one (1) or two (2) people and went to the abortion clinic a second time and did what I felt I had to do at that time again. I did not waste anymore time telling my Pastor believing that I would get the same response. A few years after my second abortion, I left my church, and never looked back. I then joined another church in which a woman Pastor ministered to me about the side effects of abortion after attending a women’s prayer meeting in which both of my abortions were exposed by me following the leading of the Holy Spirit. That was when I realized that my two (2) daughter’s were and still are human beings. I named them both that night. She then advised me to get involved in the fight against abortion and to help other young women who are suffering from the same symptoms as I was. Before I found forgiveness and healing in Christ, I battled prescription drug addiction, an alcohol addiction, and I began sleeping with more than just one (1) man including my husband at that time. Yes, abortion hurts women, however, in a message to women who have had an abortion, Pope John Paul II in the Gospel of Life, explains how their lives can be transformed by the Church’s healing ministry: “You will come to understand that nothing is definitively lost and you will also be able to ask forgiveness from your child, who is now living in the Lord. With the friendly and expert help and advice of other people, and as a result of your own painful experience, you can be among the most eloquent defenders of everyone’s right to life. Through your commitment to life, whether by accepting the birth of other children or by welcoming and caring for those most in need of someone to be close to them, you will become promoters of a new way of looking at human life.” 3 Natasha, thank you for allowing me to share your story in light of Women’s History Month. But most of all, thank you for allowing God to use you as a model of His Love and Forgiveness. Brothers, we really need to talk. 1. 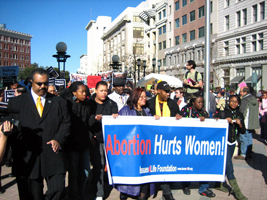 “Understanding Abortion’s Aftermath”, Project Rachel (http://bit.ly/eimlpU). 2. Special thanks to Pam Caylor, Executive Director, First Choice Pregnancy Services (http://bit.ly/gdvG98). The Issues4Life Foundation targets and works directly with African-American Pastors and Priests nationwide and is dedicated to addressing the issues surrounding the inviolability of human life in the African-American community.